Miranda Hillard does not want to deal with her husband Daniel’s antics any longer and decides the only thing to do is get a divorce. Daniel can’t handle only seeing his 3 kids once a week so he decides to try for the housekeeper position his ex is trying to fill. He gets the job, but only by dressing up as an old, British… woman. How long can he keep up the charade? Find out with a Family Movie Night! 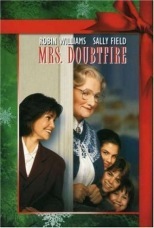 *Mrs. Doubtfire is a classic, British housekeeper and dresses the part. Invite your family or guests to wear something that she would find tasteful. Borrow something from your Grandmother or visit the second hand store to find the perfect costume. *Encourage everyone to dress up for Movie Night. Have everyone use makeup and wigs, then see who looks the least like themselves. Everyone could even come up with pretend backgrounds to go along with their new persona. *Daniel throws a crazy party for his son’s 12th Birthday. Decorate your home to look like you’re celebrating someone's birthday as well. Remember to use balloons, streamers and a “Happy Birthday” banner. *Mrs. Doubtfire knows how to keep a household tidy. Clean up your home and make everything extra precise for Movie Night. Go the extra mile by setting dinner extra fancy by using the good china and nice silverware. * Serve up some cake with a nice, creamy icing all over it for dessert. Feel free to stick your face in it right before you serve it! You could make cupcakes so everyone can try Mrs. Doubtifire’s “Meringue Facial.” Be sure if you serve tea or cocoa, as Mrs. Doubtfire often does, to have cream for people to add to their drinks. Serving the cream from your face is optional. *Have a bowl of fruit out for people to snack on. Be sure to include limes to pay tribute to the “run by fruiting” that happens at the pool. *To make Daniel look like Mrs. Doubtire they take a mold of his face. Make your own masks by Plaster-casting each guests face. You could also make more simple masks from paper. *Mrs. Doubtfire and Chris play soccer at the park together. Grab your favorite sports equipment and head to park to keep the movie adventures coming. If the weather isn’t good enough to go outside, stay inside and have a Partner Dance-Off where everyone has to be partners with the vacuum. *Mrs. Doubtfire reads Stuart Little to Natty. Grab a copy for yourself and start reading it with your family. It might just become one of your family favorites. 89% (681) have seen it. 10% (83) haven't seen it.